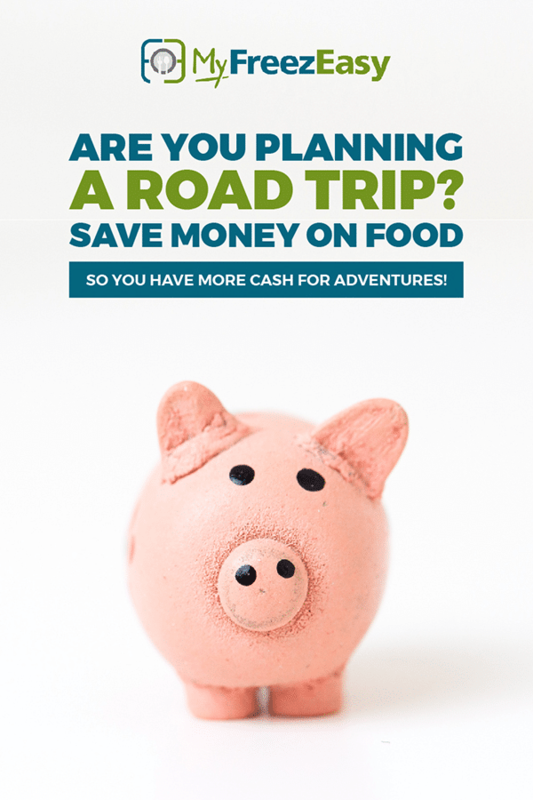 Road trip freezer meals are the best kept secret to feeding your family wholesome meals while traveling! Traveling is amazing. Especially with your whole family. You get to explore different places and make new memories. You take beautiful pictures and post them for all your friends to see. You know what those pictures don’t show? That moment that everyone starts to fall apart. It’s never an exact time, because that would be too easy. It’s sometime between lunch and dinner though. It’s a typical witching hour for the young kids, but even the older kids (a.k.a. grown ups, a.k.a. even uncle tom) are starting to be less pleasant by the minute. You see it coming, and you know you’ve got some options and you need to think quick and take action. Option 1: Eat an early dinner with the 548 other people that are feeling just as hangry as your bunch. Dinner reservations? Sure! Your table will be ready in about 2 hours. When you finally get to the table, you realize you’ll be using up half of your spending budget on this one meal that isn’t even enjoyable because Uncle Tom really can’t get it together after that long wait. Option 2: Take a deep breath and remember that dinner is already cooking and will be ready by the time you get back to the place you are staying. I know, you are probably wondering what parallel universe option 2 is available in. But the truth is, it’s not that far-fetched and it’s available to YOU! Right here, right now. Option 2 can be possible in your life with the life-changing help of freezer meals. If you aren’t familiar with why freezer meals are the best thing since sliced bread – you could check out this post about all the benefits of freezer cooking. 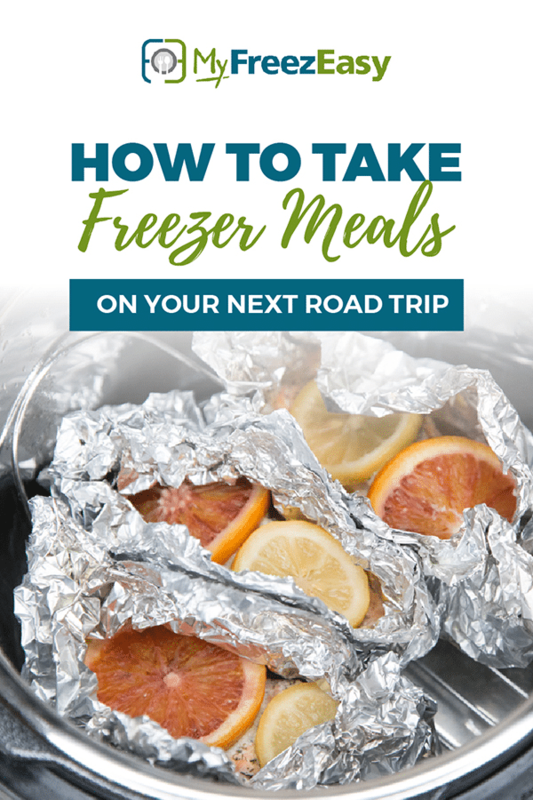 Just be sure to come back here so you can utilize these magical freezer meals on your next trip! 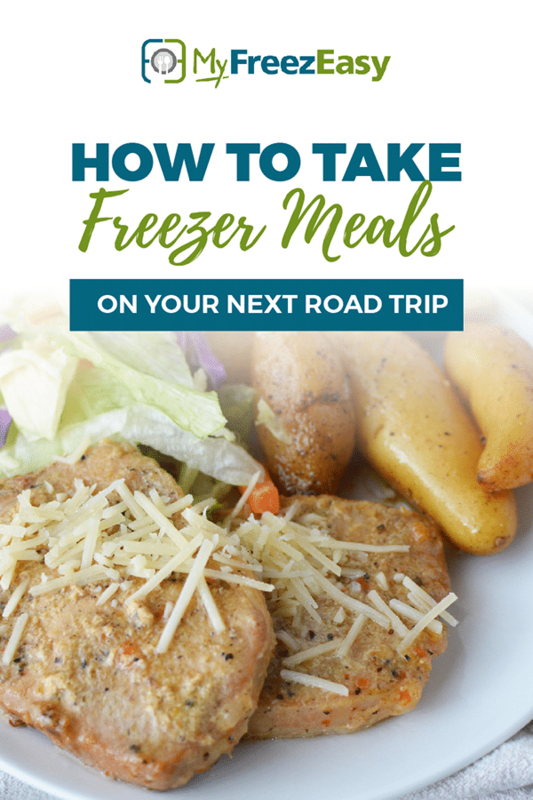 If you want to take some freezer meals on your next trip, the first thing you need to do is make a freezer meal plan. First you have to find recipes that your family loves and that are freezer meal friendly. Pinterest is a great resource for this, but it is sometimes hard to find recipes in specific categories – slow cooker freezer recipes, freezer cooker recipes with specific ingredients or that follow specific eating plans. Once you find all of the freezer meals that you want to make, you have to make a shopping list. Compiling this list gets tricky – especially if you want to double a recipe or make a certain number of servings. Often recipes call for the same ingredients – so make sure you write down what is necessary for each recipe! Did you create your shopping list based on where the ingredients are in the store? 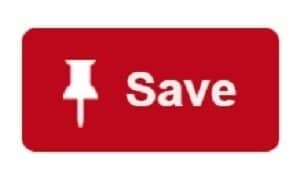 If not, you can find yourself circling back for items you forgot! Don’t forget to label all of your freezer bags with the name of the recipe, the date you made it, and any special cooking instructions needed for that recipe! I like to write what sides I usually cook with the dish- that way I don’t have to think about it on the day I am making the meal! Now that you have all of the ingredients, you have to figure out which items go with which recipes- and what steps you need to take to prepare the freezer portion on the meal. If you are making a lot of different dishes, or doubling and tripling recipes, it can can get complicated to keep them straight. Whew, that is a lot of steps! And it can take a lot of time too. There has to be an easier way, right? Well there is! MyFreezEasy makes the whole process quick, easy, and even fun! Freezer space is prime real estate in my kitchen! If you are looking to save some freezer space, I recommend “flat freezing” your freezer baggies. After putting all your ingredients in the freezer bag, remove as much as you can by pressing air bubbles out of the bag. Then, stack baggie meals together and place in your freezer. If you’re worried about the bags sticking together (this has only happened to me in my deep freezer, never in the fridge freezer! ), then you can add a small piece of wax or parchment paper in between the bags. Basically, you want to Konmari your freezer!!! Let me just tell you…digging around in your deep freezer, trying to find freezer meals that you stacked nicely to freeze isn’t always easy. They easily get buried by other meals, bags of ingredients and other items you have in the freezer. When it comes time to fish one out, I just dreaded it. You start digging. Pulling things out, one at a time. Then you think about calling off your deep freezer search for the freezer meal you want…because your fingers are about to freeze off. So instead of digging farther, you just grab the meal that’s on top and go with that for dinner instead of the meal you set out to find. I knew I needed a better system for these stacked freezer meals. In the past, I’ve tried to fit a box from Costco…but it was too large. So when this perfectly size box showed up from Amazon, I took action, wrapped the folding tops in duct tape and made a “taller box” to hold our freezer meals upright. So they are easier to find and grab!!! See – Konmari-ed – where everything is easy to see and pull from the box! And no more frozen fingertips from digging through the freezer! Imagine you’ve made a set of fantastic freezer meals. All the ingredients were carefully loaded into their bags. The labels were printed and stuck on the bags. You happily stacked your meals into the freezer with a smile. You go to pull out your favorite meal a few days later and… all the bags are STUCK. As you try to pull the bags apart, they tear. Now you’ve got a big mess. So much for stress free dinner, huh? Nope. This isn’t your story. 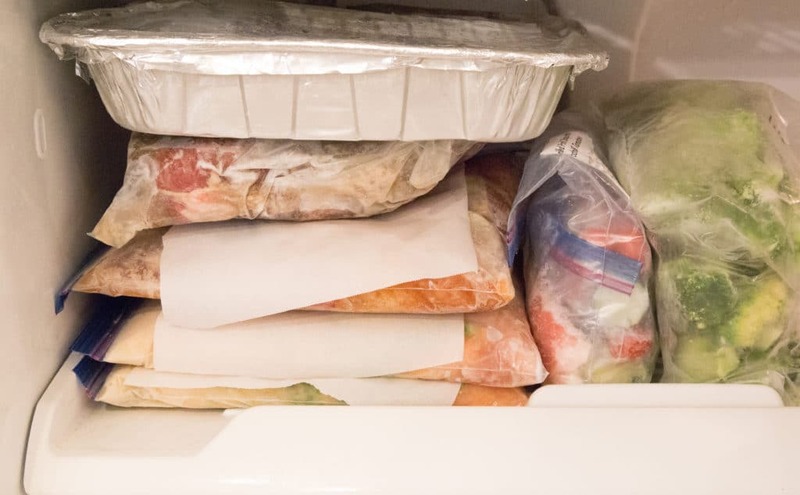 After you prepped the meals, you stacked them into the freezer with a sheet of parchment of paper between each one. Or a piece of foil. Also, don’t forget to stand up your meals in a box once they are frozen, so you’ll be able to easily grab them from your freezer! Freezer to Slow Cooker Meals are the BEST MINDLESS way to do dinner. Drop them frozen into the slow cooker in the morning and you’ve got dinner waiting at the end of the day. They are the perfect solution for getting a delicious and healthy meal on the table on busy weeknights. With freezer to slow cooker recipes, dinner is even more hands-off and hassle-free. The practicality and simplicity of make ahead freezer meals is undeniable. 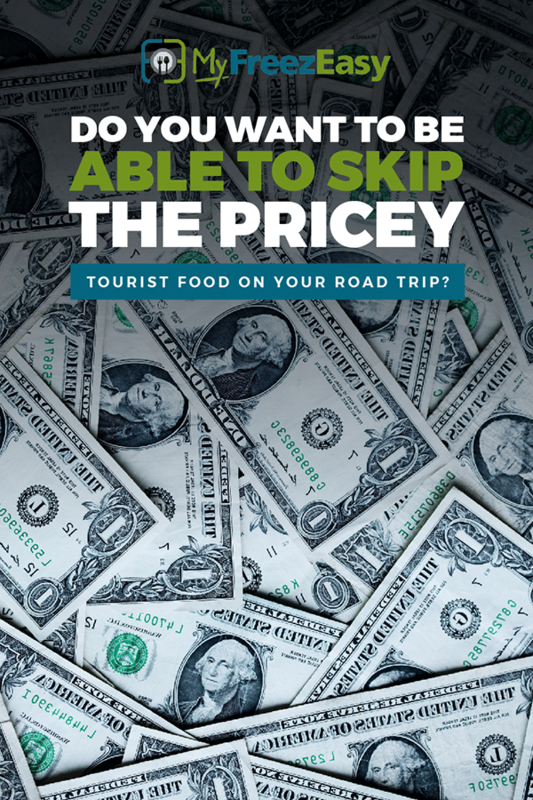 They are cheaper than fast food, faster than sitting in the drive thru, and the health and nutrition of these meals surpasses the other fast-food options out there. These recipes are the secret to the fastest possible meal at home by combining the convenience of freezer meals with the practicality of quickly pulling together simple, delicious ingredients that freeze well and cook well, so you end up with an amazing dinner waiting for you when you get home – it’s a magical methodology that will change the way you operate in the kitchen. 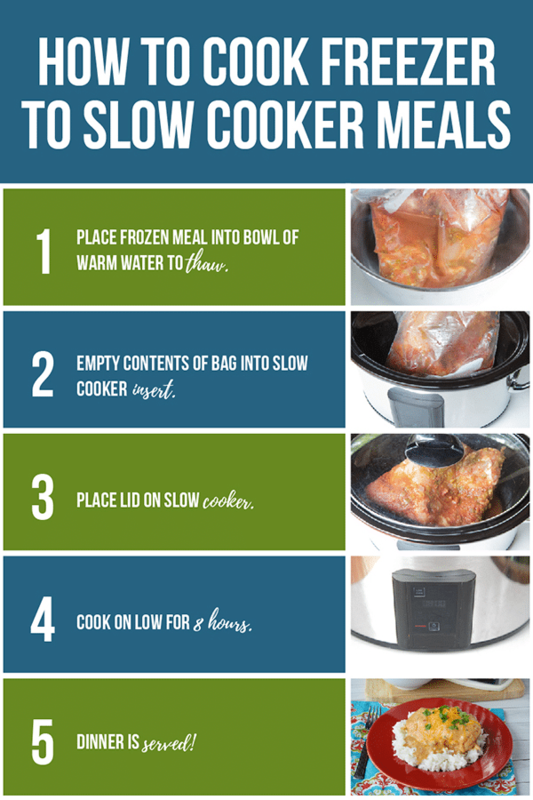 Freezer to slow cooker meals will help you spend less time in the kitchen, and more time doing what you love. They will help you eat healthier and save money on groceries too. Pull meal from freezer and thaw in warm bowl of water for five minutes. You want to get it thawed enough to separate the ingredients from the bag. Pour the contents of the bag into the slow cooker insert. Set slow cooker on low for at least 8 hours. Instant Pot freezer meals are your best bet for fuss-free dinners. Plus, you get dinner on the table in a flash! Like, less than an hour. Totally possible to take a rock solid, frozen ball of delicious to warm bowl of chili in 58 minutes. As a matter of fact, you’ll be ladling it into serving bowls in 58 minutes. You’re going to need an Instant Pot or electric pressure cooker. Times and notes below based on Instant Pot DUO, 6 qt. Fill freezer bag with ingredients using, using FreezEasy Bag Holders. Seal bag and place into round bowl, that is smaller in diameter than your electric pressure cooker insert. Place bowl and meal into the freezer and let freeze overnight. Remove bowl once it’s the “frozen ball of delicious” is formed. 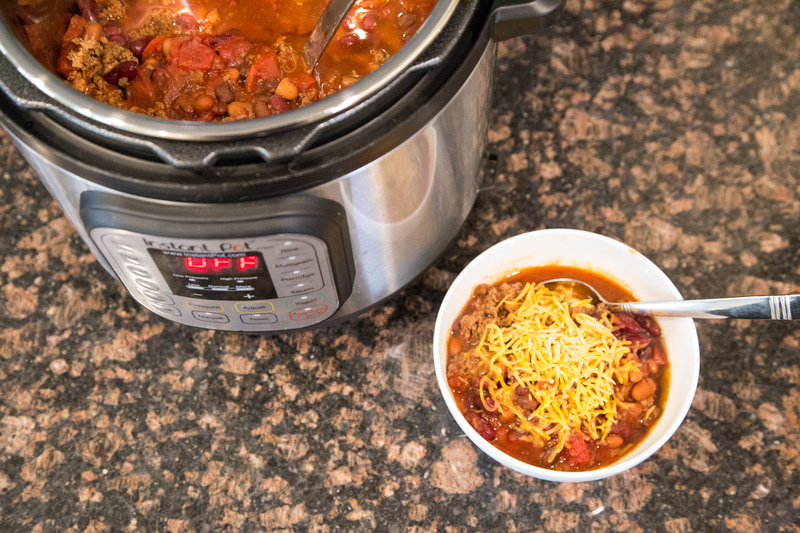 When you are ready to make the chili, place it in a bowl of warm water for 5 minutes to “quick thaw.” This is just to loosen the frozen food from the baggie. Pull the bag out of the bowl of warm water and open it up. Flip it upside down directly into the electric pressure cooker insert. Add 1 to 2 cups of water or broth. Wait 23 minutes for it to come to pressure, then wait 30 minutes to finish cooking. Start to finish. From frozen solid to ladling into bowls. With about 3 minutes of “hands on time.” Most of the defrosting and reheating happens inside the electric pressure cooker. Ah, foil packs. They are one of the best kept secrets of freezer meals, in my opinion. They open up a variety of possibilities for many common dinnertime struggles. Serving size is never an issue, because you can pull out as many servings as you need for each meal. Dietary preferences or allergies are easier, because you can put different ingredients in each pack. I prepare the packs as directed in the recipe and then place them onto a flat baking sheet in the freezer. Let them freeze (2+ hours) and then transfer the frozen foil packs to a baggie and tuck back into your freezer. Freezing them flat will help the food stay flat, and this also reduces the risk of the foil tearing. I love that these meals are pre-portioned and you can toss just about any side dish with them. This is helpful for adjusting serving sizes! For example, you could pull out extra packs if you have company, or less if maybe some of your crew is out of the house for the evening. Most of the MyFreezEasy foil pack recipes are a protein, sauce and veggie. We are sharing more and more into the Freezer Meal Plan Builder as we go add to our database! You can view our full database of recipes here. That’s right – drop those foil packs into the Instant Pot and let it take care of the cooking for you. Because the way that an electric pressure cooker uses heat and pressure to cook, this salmon turned out beautifully with just the right amount of flavor soaked into the salmon and a lovely citrus-dill juice around it in each pack. Simply delightful! With these foil packs, the time will vary based on the thickness of the salmon and how many packs and the size of your IP. I easily fit 4 of these foil packs, 2 layers deep, into my 6 quart Instant Pot. If I were going to make 6-8 foil packs, then you’ll need to use an 8 quart size. I cooked 4 foil packs in 6 Qt. IP for 18 minutes and they were perfect. If you go to cook yours and they aren’t quite finished, just put the lid back on and add a few minutes and let finish cooking. If you want to err on the side of caution, add a few minutes to make it 20-21 minutes…you won’t have to worry about drying out or overcooking because the salmon is wrapped in foil and “steaming” inside, and there is plenty of juice from the fruit slices. Note: I ALWAYS recommend thawing all seafood completely before cooking it, and this holds true for these as well. You can freeze these foil packs in advance, but if you’re going to cook the in the oven/grill/IP, you definitely want the salmon to be thawed completely before cooking. 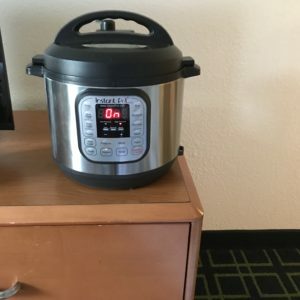 If you want more information about freezer to Instant Pot meals, read this! And finally, because salmon is more expensive that other meaty proteins, I always pair it with inexpensive side dishes like rice and whatever veggies were on sale in the produce or freezer departments. Opening Your Foil Packs: Use Caution! Whether you’ve cooked your foil packs out on the grill, or in the Instant Pot, you need to be careful when opening them as hot hot hot steam will release from the pack. You can slit the foil towards the top with a small knife, or you could carefully create an opening in the top of the foil. Let the steam escape before opening completely. 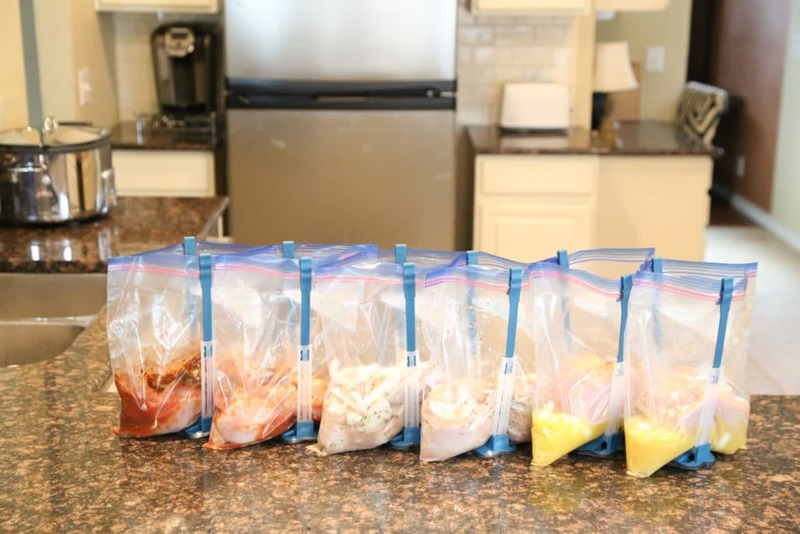 Take some extra storage bags for leftovers. Foil pack meals are perfect for camping. Check out my post on foil pack recipes here. Order groceries to be delivered to your vacation spot after you get there, if available in the area. 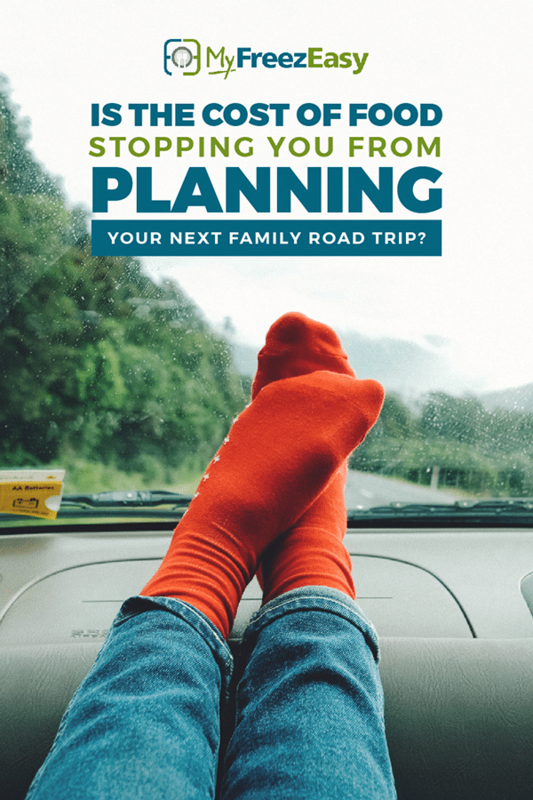 No need to waste time shopping while on vacation! Prepare snacks for the road before you leave.